From his corner office on the sixth floor of the Multnomah County building, County Chairman Ted Wheeler has a panoramic view of a lot of money; looking west is downtown Portland and the Pearl District, and looking north, the Interstate corridor and the Northeast renaissance. The city grows all around him. Which makes dealing with a $46 million budget shortfall all the more bitter. For the ninth year in a row, Multnomah County has been defunding — cutting public safety and health services — in order to adjust to a regressive tax formula for urban renewal. Do not avert your eyes. Yes, the subjects of urban renewal areas and tax increment financing make for a powerful sedative, but they have begun to light fires under politicians’ and taxpayers’ feet. They are workhorses in local development plans, including a 30 percent dedication of those funds toward affordable housing. It’s how tax dollars move in this town, for better or worse. The urban renewal construct - which draws an increment of property tax dollars as a funding incentive for projects in “blighted” areas — most recently flared up over the Major League Soccer deal. That proposal sought to draw urban renewal funds to build a minor league baseball stadium in Lents. It was later withdrawn, with Wheeler being the stony messenger decrying the use of such funds for such a project, and the consequences in depleting a property tax base that suports education, health care and safety programs in the most populated county in Oregon. Joanne Zuhl: In your opinion, do you think the city has responsibly used urban renewal areas to this point? 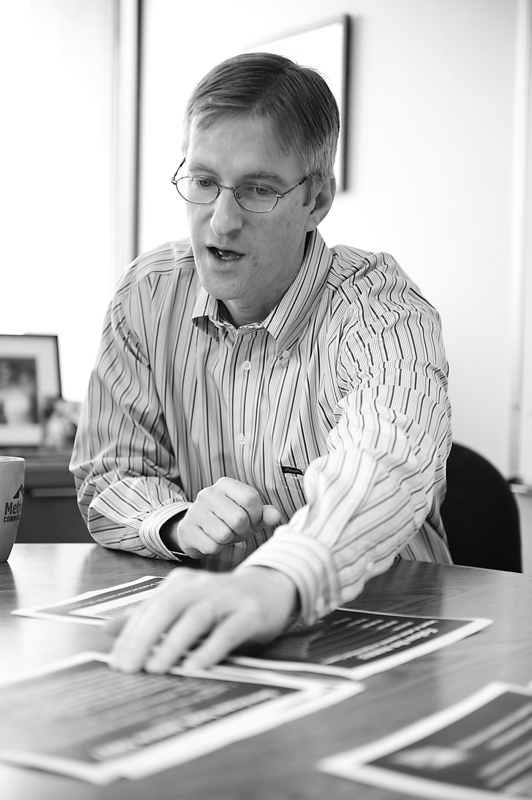 Ted Wheeler: I support urban development, I support job creation, I support the creation of urban renewal areas around truly blighted areas that would not be developed but for the investment of tax increment financing in those areas. I’m fundamentally opposed to the improper use of tax increment financing. If you invested in an area that is not truly blighted, you’re simply taking dollars away from a jurisdiction that would be providing important community services, whether it’s education, basic health, or basic human services. J.Z. : On those criteria, how has the city performed? T.W. : I think it has been a mixed bag, to be honest. It’s not just the city. I don’t think the county has been paying attention either, historically. We have not been good advocates for our basic services, nor have we made a clear statement to the community about the real trade offs that exist between creating new urban renewal areas and our ability to deliver basic health and safety services in this community. I’m interested in the business at hand — which is whether we should create new urban renewal areas and whether we should expand existing ones. What I want to do is drive into that conversation this very important issue of the trade off between existing services and the projects in urban renewal areas. My concern has been that because the county and the school districts have been asleep at the switch, and because the City Council has had this powerful tool, tax increment financing, available to it with virtually no oversight, they’ve used it as an ATM for projects that are important to the City Council but aren’t necessarily a top priority to the citizens of this community. Tax increment financing (TIF) is easy money, and it shouldn’t be easy money. It should be the dollars of last resort. There are other ways you can fund projects, whether it’s debt, whether it’s an economic enterprise zone, whether it’s going out and finding private-sector investors. You should only use TIF in the case where there couldn’t be any other development but for the TIF dollars. J.Z. : Do we really have areas of such blight - that we need urban renewal incentives? T.W. : The legal definition of blight is wishy-washy, so that almost any neighborhood in this city could be described as blighted. Blight includes surfaced parking lots, improper developments that were mistakes that were made previously. J.Z. : It almost included Lents Park. T.W. : Yes. The (Lents Urban Renewal Area) committee asked very pointed questions about the definition of blight. The informal conclusion was just about anything can be construed as blight. So it’s really up to the people who create the urban renewal areas to make the case that they’re investing dollars in a blighted area. And blight shouldn’t just be this wishy-washy, open-ended definition. It should be easy to define. And you should be able to convince people using common-sense terms that the place you’re investing is truly a blighted area. J.Z. : So how do you get the average Joe to understand your concerns about urban renewal areas? T.W. : It’s very complicated. There’s no easy way to explain it. Except to say that if you build a project using this construct, those dollars come from somewhere. They come from services that currently exist in the community, whether it is health clinics, whether it is drug treatment centers, sheriff patrol officers, jail beds, library services, schools, and school days in the classroom. That’s what you’re trading off in those projects. You better be absolutely positive the projects that are being built are of a higher value than the services you’re going to lose. We are, by creating urban renewal areas, prioritizing services that we want to deliver in this community. The reason I’m so concerned about this is because Multnomah County government is defunding. Since 1997, we’ve lost a great many of our services. This year, we’ve had a $46 million budget shortfall. We took cuts across the board – in human services and public safety in order to close that shortfall. J.Z. : How did the 1997 changes to urban renewal change the county’s financial future? T.W. : When Measure 5 was passed, that basically ended urban renewal. From about 1991 to 1995, there were about zero dollars going into urban renewal. Then there was the passage of Measure 47 in 1996. Measure 47 had some problems with it, so the Legislature started negotiating to put a legislative fix, which was Measure 50. There were a lot of negotiations for the Legislature to get the support of the proponents of Measure 47. One of the things they negotiated was the continuation of urban renewal investments. But they did that at the expense of funding public services at the local level, most notably schools and county government that are very heavily reliant on property taxes. We’ve lost hundreds of jail beds, alternatives to incarceration, the successful school attendance initiative, health clinics, early intervention programs for juvenile offenders, and this year we lost more public safety capacity, community corrections, alcohol and drug treatment services. J.Z. : Is it your goal to change this formula to direct more to the county? T.W. : That formula has been changed. There was legislation that would return some of the increment to the county, some number of years from now, in certain circumstances. It’s better than what we’ve got today, but we’re talking about dollars returned to the county some other day. It’s an improvement, but it doesn’t change the fact that if you create a new urban renewal area today, it takes away from services that currently exist, and it’s doubly bad if you create an urban renewal area in an area that’s not really blighted. My overall goal here is to raise the profile of this issue and make it very clear at least to policy makers if not the public at large that we are making some very strong statements about what our priorities are in the community. My priorities are basic safety and health services for the community. That is the county’s mission, that is my priority, and I will fight tooth and nail to support that dual mission around public safety and public health. J.Z. : How does your compromised budget affect the entire continuum of affordable housing and homeless efforts? T.W. : We are engaged, committed, leading partners in the 10-year plan to end homelessness. That plan focuses on those in our community who are chronically homeless. Housing is the first critical step, but it’s not the only step. You need support services. The housing is the anchor, the linchpin to the whole thing, but it’s not sufficient on its own without community support, alcohol and drug treatment programs, other anti-poverty services that people need access to. While the city provides the housing, we provide the wrap-around support services that make that housing successful. And to build the housing at the expense of these very necessary wrap-around services does not make good economic sense or good sense from the perspective of a successful service delivery. We need to think more globally, get over our own jurisdictional interests and talk about how we as a community, as schools, as a county organization, as the city of Portland, as the PDC, how we can work collectively to support a vibrant and successful community, and not come at each other, and certainly not take tax base from each other without thinking about the broader sense of the community. J.Z. : How much of the effort for the mental health center is jeopardized by the county’s budget situation? T.W. : The county is not in good financial shape and it has not been in good financial shape since the passage of Measure 50. Measure 50 took our legs out from under us. We are by state statute heavily dependent on property taxes to support the services the community wants us to deliver, whether it’s health, public safety, library services. We are dependent upon property taxes, and Measure 50 took the wind out of our sails. We have been defunding since the passage of Measure 50. This was our ninth straight year of budget cuts. They are larger this year because we’re in a down economy. But even during the go-go years, from 2003-07, we were taking massive cuts. Property taxes are capped. The cost of our services grows at a much faster rate than the revenues coming in the door. J.Z. : What’s the agenda for the next Legislature to do something about this? T.W. : There are already people, certainly myself and others in this organization, and other county organizations and school districts around the state, and a number of legislators, who are very interested in looking at property tax limitation reform. Because Measure 50, make no mistake about it, whether you’re liberal or a conservative, Measure 50 will make local government extinct in the state of Oregon. And you can see just by the loss of services in Multnomah County since the passage of Measure 50, we are rapidly defunding. There are other counties who are ahead of us. Many of the rural counties will find themselves virtually insolvent before Multnomah County does. This is not just about the taxes. It’s also about local control. About a community’s ability to provide the services people say they want local government to deliver. And our hands are tied by Measure 50.